This is just a short note to provide an alternative way of proving and using De Moivre’s Theorem. It is inspired by the fact that the geometric multiplication of complex numbers appeared on the Leaving Cert Project Maths paper (even though it isn’t on the syllabus — lol). It assumes familiarity with the basic properties of the complex numbers. 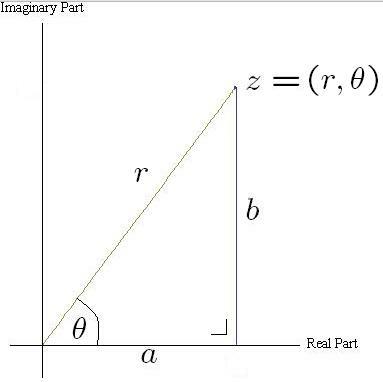 Arguably, the complex numbers arose as a way to find the roots of all polynomial functions. 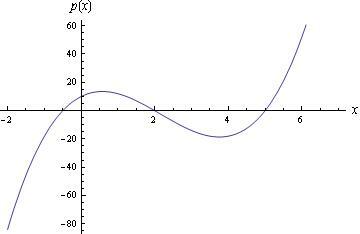 A polynomial function is a function that is a sum of powers of . For example, is a polynomial. The highest non-zero power of a polynomial is called it’s degree. Ordinarily at LC level we consider polynomials where the multiples of — the coefficients — are real numbers, but a lot of the theory holds when the coefficients are complex numbers (note that the Conjugate Root Theorem only holds when the coefficients are real). Here we won’t say anything about the coefficients and just call them numbers. is a polynomial of degree . In many instances, the first thing we want to know about a polynomial is what are its roots. The roots of a polynomial are the inputs such that the output . A number is a root of a polynomial if and only if . The roots of are where the graph cuts the -axis at and . If we want to be able to solve all polynomials we need complex numbers — and the Fundamental Theorem of Algebra says that the complex numbers are enough — we don’t need stranger and stranger types of numbers to find the roots of polynomials. 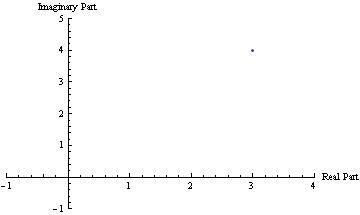 A complex number is a number of the form where . We denote the set of complex numbers by . 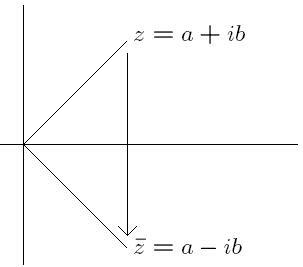 Now there is another way to look as complex numbers — as vectors with a magnitude (distance from the origin) and direction (angle made with the positive real-axis). 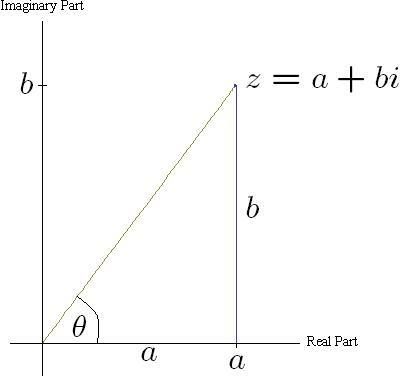 A quick application of Pythagoras Theorem shows that the magnitude, , of a complex number , is given by (also denoted by ). The angle, or argument, of is harder to write a single definition for but in this case is given by . This implies that instead of writing or even , we could write . These are called polar coordinates — while the ‘normal’ coordinates are called cartesian coordinates (i.e. ). Suppose we know that a complex number is given in polar coordinates by — what is this in cartesian coordinates? That is, suppose — what are ? Take the sine and cosine of . Just to be safe, we should make sure that if , then and . That is a straightforward exercise, and that is clear from the definition of sine and cosine. As mentioned above, we can define the multiplication of complex of numbers in a very natural way. Consider the complex numbers . By definition, ; therefore ; and . Multiplying by is the same by rotating through the right angle . Does this work for other numbers? Suppose has argument ; is found by rotating through ? The answer to this is YES. 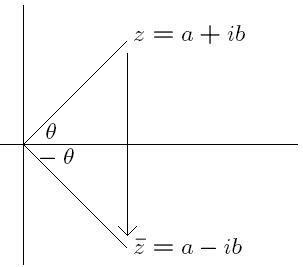 Algebraic multiplication of complex numbers corresponds to rotation in the geometric picture. 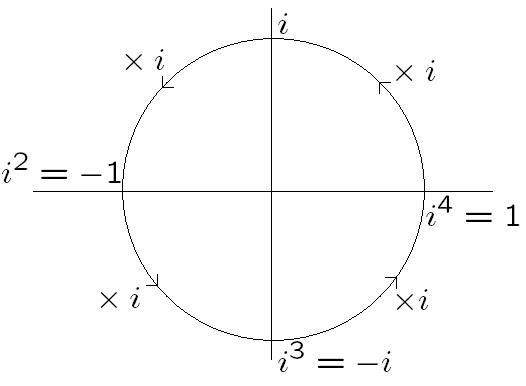 To be precise, if is a complex number with argument , and is a complex number with argument , then the argument of is — plus a rotation through an angle — i.e. the argument of is . To show that is a standard exercise in cartesian coordinates; here we give our main result where this fact is showed even more straightforwardly. Suppose that has magnitude and argument ; and has magnitude and argument . Then the product of and has magnitude and argument . A lot more elegant in my opinion than the standard approach! Note that if we multiply together complex numbers and such that , we can just take out multiples of as and for . Compare this with . 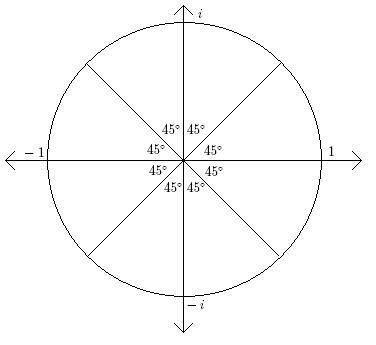 We can see from the Argand Diagram that has argument so multiplying by four more times will add a rotation of each time yielding . But of course this is just equivalent to — and once we note that we have that must equal . The conjugate of is given by . This work makes De Moivre’s Theorem very straightforward indeed. Proof : Well, this isn’t really necessary — it really is obvious with the work done above. which is true (draw a diagram). Now suppose , say for . Let , where . Use De Moivre’s Theorem to evaluate and . Recall the set of complex numbers — which can be written in polar form . What happens when we take any of these to the power of four? Suppose that is a polynomial. Then is a root of if and only if is a factor of . Moreover, the are the roots of . How is this relevant to the fourth powers of 1? Well finding solutions to is equivalent to finding roots of the polynomial . The Fundamental Theorem of Algebra guarantees that there are only four such roots — hence if we find four we know that there are no more! We will use this fact in the sequel: roots can be repeated, but if we find distinct solutions of a degree polynomial, we know that there are no more solutions. Hence to find all the -th roots of unity it suffices to draw the unit circle, divide equally into sectors and these are the -roots! are three distinct solutions to the equation — hence three distinct roots of the degree three polynomial — and therefore they are all of them. Find the two complex numbers for which . Had to solve the equation and answer in rectangular form. Book doesn’t have answers. The first issue is that is a quadratic (like and so has TWO solutions. you only get one solution. There are two solutions — where is the other? You can solve it cheaply by knowing that a quadratic has two solutions… ah, is the other (by the way the problem in taking the square root of both sides is that — if is positive and if is negative (e.g. ))! So there are two solutions and that is the number one problem. Here we give two solutions — the first is more general. where and so are ‘multiples of /full revolutions’. Solution 2 — only works for really. Note that also and so is also a solution. There are only two solutions because it is a quadratic and because we have found two we are done. To understand this in more depth read the above piece.